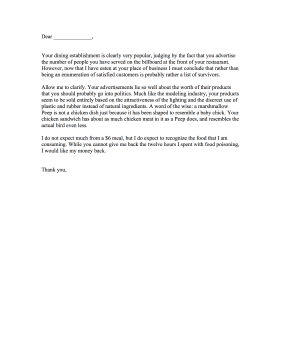 Restaurant customers can use this food quality complaint letter to request better culinary standards. Your dining establishment is clearly very popular, judging by the fact that you advertise the number of people you have served on the billboard at the front of your restaurant. However, now that I have eaten at your place of business I must conclude that rather than being an enumeration of satisfied customers is probably rather a list of survivors. Allow me to clarify. Your advertisements lie so well about the worth of their products that you should probably go into politics. Much like the modeling industry, your products seem to be sold entirely based on the attractiveness of the lighting and the discreet use of plastic and rubber instead of natural ingredients. A word of the wise: a marshmallow Peep is not a chicken dish just because it has been shaped to resemble a baby chick. Your chicken sandwich has about as much chicken meat in it as a Peep does, and resembles the actual bird even less. I do not expect much from a $6 meal, but I do expect to recognize the food that I am consuming. While you cannot give me back the twelve hours I spent with food poisoning, I would like my money back.